For other people named Michael Jordan, see Michael Jordan (disambiguation). Michael Bakari Jordan (born February 9, 1987) is an American actor. He is known for his film roles as shooting victim Oscar Grant in the drama Fruitvale Station (2013), boxer Adonis Creed in the Rocky sequel film Creed (2015) and main antagonist Erik Killmonger in Black Panther (2018), all three of which were directed by Ryan Coogler. Jordan's television roles include Wallace in the HBO series The Wire (2002), Reggie Montgomery in the ABC series All My Children (2003–2006) and Vince Howard in the NBC drama series Friday Night Lights (2009–2011). His other film performances also include Maurice "Bumps" Wilson in Red Tails (2012), Steve Montgomery in Chronicle (2012), Mikey in That Awkward Moment (2014) and the Human Torch in Fantastic Four (2015). Jordan was born in Santa Ana, California, the son of Donna (née Davis), an artist and high school guidance counselor, and Michael A. Jordan. He has an older sister, Jamila, who works in production, and a younger brother, Khalid, who was a football player at Howard University. Jordan's family spent two years in California before moving to Newark, New Jersey. He attended Newark Arts High School, where his mother works, and where he played basketball. Jordan worked as a child model for several companies and brands, including Modell's sporting goods and Toys "R" Us, before deciding to embark on a career as an actor. He launched his career as a professional actor in 1999, when he appeared briefly in single episodes of the television series Cosby and The Sopranos. His first principal film role followed in 2001 when he was featured in Hardball, which starred Keanu Reeves. In 2002, he gained more attention by playing the small but pivotal role of Wallace in the first season of HBO's The Wire. In March 2003, he joined the cast of All My Children playing Reggie Montgomery replacing Chadwick Boseman, a troubled teenager, until June 2006 when Jordan was released from his contract. Jordan's other credits include guest starring appearances on CSI: Crime Scene Investigation, Without a Trace and Cold Case. Thereafter, he had a lead role in the independent film Blackout and starred in The Assistants on The-N. In 2008, Jordan appeared in the music video "Did You Wrong" by R&B artist Pleasure P. In 2009, he guest-starred on Burn Notice in the episode "Hot Spot", playing a high school football player who got into a fight and is being hunted by a local gangster. In 2010, he guest-starred in the Law & Order: Criminal Intent episode "Inhumane Society" as a boxer involved in a Michael Vick-inspired dog fighting scandal. In 2009, Jordan began starring in the NBC drama Friday Night Lights as quarterback Vince Howard, and lived in an apartment in Austin where the show was filmed. He played the character for two seasons until the show ended in 2011. In 2010, he was considered one of the 55 faces of the future by Nylon Magazine's Young Hollywood Issue. That year, he landed a recurring role on the NBC show Parenthood playing Alex (Haddie Braverman's love interest). This marked his second collaboration with showrunner Jason Katims, who was in charge of Friday Night Lights. BuddyTV ranked him #80 on its list of "TV's Sexiest Men of 2011". Jordan voiced Jace in the Xbox 360 game Gears of War 3. In 2012, Jordan appeared in the George Lucas-produced movie Red Tails and played lead character Steve Montgomery in Chronicle, a film about three teenaged boys who develop superhuman abilities. He also guest-starred in an episode of House's final season, playing a blind patient. In 2013, Jordan starred as shooting victim Oscar Grant in Fruitvale Station, directed by Ryan Coogler. His performance earned him critical acclaim; The Hollywood Reporter film critic Todd McCarthy writing that he reminded him of "a young Denzel Washington". Following his role in Fruitvale Station, Jordan was named an "actor to watch" by People and Variety. Time named him with Coogler one of 30 people under 30 who are changing the world and he was also named one of 2013's breakout stars by Entertainment Weekly and GQ. In 2015, he starred as Johnny Storm, the Human Torch, in Fantastic Four. The film was universally panned by critics, holding a 9% approval rating on Rotten Tomatoes, and was a bust at the box office. 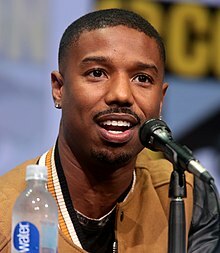 However, later in 2015, Jordan rebounded with critical acclaim and positive reviews when he starred as Adonis Creed, the son of boxer Apollo Creed in the Rocky sequel Creed, his second collaboration with Coogler, which co-starred Sylvester Stallone. Jordan prepared for his role as a boxer in Creed by undertaking one year of rigorous physical training and a stringent low-fat diet. He did not have a body double during filming and was "routinely bloodied, bruised, and dizzy" when fighting scenes were being filmed. In October 2017, it was announced that Jordan was cast in a supporting role as Mark Reese in the upcoming Netflix superhero series, Raising Dion. In February 2018, Jordan starred as the villain Erik Killmonger in Marvel's Black Panther; this marked Jordan's third collaboration with Coogler. Jordan received critical acclaim for his performance in Black Panther. Dani Di Placido of Forbes Magazine claimed that Jordan "steals the show" and Jason Guerrasio of Business Insider wrote that "Jordan plays a Killmonger fueled with hate and emptiness—we won't give away why—but he also delivers it with a swagger that's just a joy to watch ... the movie takes off more in story and viewing enjoyment whenever Jordan is on screen." Later in 2018, Jordan starred in Fahrenheit 451 with Michael Shannon and Sofia Boutella. The television film was distributed on HBO by HBO Films. That same year, Jordan reprised his role as boxer Adonis Creed in Creed II, a sequel to Creed (2015) and the eighth installment in the Rocky film series. Creed II was released in the United States by Metro-Goldwyn-Mayer on November 21, 2018. The film received generally positive reviews from critics and it went on to debut to $35.3 million in its opening weekend (a five-day total of $55.8 million), marking the biggest debut ever for a live-action release over Thanksgiving.. He also voices the character Julian Chase in Rooster Teeth's animated series, Gen:Lock, which he also co-produces through his production company, Outlier Society Productions since January 2019. Jordan will portray Bryan Stevenson in a biopic titled Just Mercy, which he will also produce. The film is scheduled to be released in January 2020. Next, he will star in Without Remorse, based on the book by Tom Clancy, as John Clark, a former Navy SEAL and director of the elite counterterrorism unit Rainbow Six. The film will be released on September 18, 2020. He is slated to re-team with Coogler for the fourth time in a film titled Wrong Answer, based on the Atlanta Public Schools cheating scandal. Jordan is also scheduled to appear in a second remake of The Thomas Crown Affair. Jordan will also star in Journal for Jordan, to be directed by Denzel Washington, as a soldier who "kept a journal full of poignant life lessons for their newborn son, Jordan, while deployed overseas." In March 2017, it was reported that Warner Bros. wants to cast Jordan as a younger version of Morpheus in a possible prequel to The Matrix. Jordan has lived in Los Angeles since 2006. He grew up in a religious household and considers himself to be "spiritual". As of 2018[update], he lived with his parents in a Sherman Oaks home that he purchased. 1999 The Sopranos Rideland Kid Episode: "Down Neck"
Cosby Mike Episode: "The Vesey Method"
2006 CSI: Crime Scene Investigation Morris Episode: "Poppin' Tags"
Without a Trace Jesse Lewis Episode: "The Calm Before"
2007 Cold Case Michael Carter Episode: "Wunderkind"
2009 Burn Notice Corey Jensen Episode: "Hot Spot"
Bones Perry Wilson Episode: "The Plain in the Prodigy"
2010 Law & Order: Criminal Intent Danny Ford Episode: "Inhumane Society"
2012 House Will Westwood Episode: "Love Is Blind"
2014 The Boondocks Pretty Boy Flizzy (voice) Episode: "Pretty Boy Flizzy"
2015 Running Wild with Bear Grylls Himself Episode: "Michael B. Jordan"
^ Bronner, Sasha (January 23, 2013). "Michael B. Jordan, 'Fruitvale' Star, Reveals His Early Tap Dancing Roots (PHOTOS)". The Huffington Post. ^ Barker, Andrew (November 18, 2015). "Film Review: 'Creed'". Variety. Retrieved February 23, 2018. ^ a b Placido, Dani Di. "'Black Panther' Review: Killmonger Steals The Show". Retrieved February 21, 2018. ^ a b "'Black Panther' is the rare Marvel movie that makes you care about the villain — and Michael B. Jordan delivers an incredible performance". Retrieved February 21, 2018. ^ "The Ascent of 'Black Panther' Director Ryan Coogler". The Hollywood Reporter. Retrieved February 18, 2018. ^ Friedman, Jackie (February 3, 2010). "Tap-dancing, Howard-bound lineman Khalid Jordan first from Arts High to earn full athletic scholarship". NJ.com. Retrieved June 16, 2013. ^ Bronner, Sasha (January 23, 2013). "Michael B. Jordan, 'Fruitvale' Star, Reveals His Early Tap Dancing Roots (PHOTOS)". The Huffington Post. Retrieved June 17, 2013. ^ a b Politi, Steve (July 15, 2011). "Politi: 'Friday Night Lights' is over, but Newark's Michael B. Jordan is just getting started". NJ.com. Retrieved August 3, 2011. ^ Herzog, Laura. "Creed star Michael B. Jordan gets key to hometown of Newark", NJ Advance Media for NJ.com, November 18, 2015. Accessed August 14, 2018. "Raised in Newark, Jordan studied drama at the public magnet Newark Arts High School, where his mother is still a teacher, city officials said." ^ Morales, Wilson (September 2002). "On His Own : An Interview with Michael B. Jordan". blackfilm.com. Retrieved August 4, 2011. ^ Kaufman, Amy; Horn, John (January 22, 2013). "Are they the Sundance Film Festival's next finds?". Los Angeles Times. Retrieved June 16, 2013. ^ Kroll, Dan J. (August 25, 2006). "Jordan out, Reggie to remain "missing"". Soapcentral. Retrieved June 17, 2013. ^ "Photos/ CSI Guest Stars: Celebrity DNA – Michael B. Jordan". E! Online. Retrieved June 17, 2013. ^ Koski, Genevieve (July 15, 2011). "Interview Michael B. Jordan". The A.V. Club. Retrieved August 4, 2011. ^ Ausiello, Michael (August 17, 2009). "Exclusive: 'Friday Night Lights' drafts Michael Jordan!". Entertainment Weekly. Retrieved June 17, 2013. ^ "YOUNG HOLLYWOOD 2010 PREVIEW". Youtube. April 20, 2010. Retrieved August 5, 2011. ^ "Nylon Magazine: Young Hollywood Issue". The CR Journal. May 18, 2010. Retrieved August 5, 2011. ^ Keck, William (August 13, 2010). "Keck's Exclusives: Friday Night Lights' Quarterback to Romance Parenthood Daughter". TV Guide. Retrieved June 17, 2013. ^ "TV's 100 Sexiest Men of 2011". BuddyTV. Retrieved March 9, 2012. ^ "Michael B Jordan replaces Drake as Jace in Gears of War 3". N4G.com. April 22, 2011. Retrieved April 22, 2011. ^ Clark, Krystal (April 6, 2009). "George Lucas Finally Casts Red Tails". ScreenCrave. Archived from the original on October 19, 2013. Retrieved June 17, 2013. ^ "'Chronicle' Trailer: Teens Become Superheroes". The Huffington Post. October 19, 2011. Retrieved October 23, 2011. ^ Ng, Philiana (January 3, 2012). "'Friday Night Lights' Actor Lands Guest Role on 'House'". The Hollywood Reporter. Retrieved January 5, 2012. ^ McCarthy, Todd (January 20, 2013). "Fruitvale: Sundance Review". The Hollywood Reporter. Retrieved June 16, 2013. ^ Jordan, Julie (October 10, 2013). "PEOPLE's Ones to Watch: Andy Samberg, Sam Claflin & More Top This Year's List". People. Retrieved October 10, 2013. ^ Kaufman, Anthony (October 9, 2013). "10 Actors to Watch: Michael B. Jordan Arrives With 'Fruitvale Station'". Variety. Retrieved October 10, 2013. ^ Begley, Sarah (December 5, 2013). "These Are the 30 People Under 30 Changing the World Read more: Michael B. Jordan and Ryan Coogler". Time. Retrieved December 25, 2013. ^ "Breakout Stars of 2013 – Michael B. Jordan". Entertainment Weekly. December 25, 2013. Retrieved December 28, 2013. ^ "Michael B. Jordan: Breakout of the Year 2013". GQ. December 2, 2013. Retrieved December 29, 2013. ^ "Michael B. Jordan Signed On For 'Fantastic Four'". vibe. October 21, 2013. ^ Kroll, Justin (February 19, 2014). "'Fantastic Four' Cast Revealed". Variety. Retrieved February 20, 2014. ^ "Fox Looking To Dump Fantastic Four Director, Screenplay And Recast, Six Months Before They Are Due To Shoot (UPDATE)". Bleeding Cool. March 14, 2014. Retrieved March 14, 2014. ^ a b Buckley, Cara (October 28, 2015). "Michael B. Jordan Gives Millennials Their 'Rocky' With 'Creed'". The New York Times. ISSN 0362-4331. Retrieved October 29, 2015. ^ Littleton, Cynthia (October 6, 2017). "Netflix Gives Series Order to Michael B. Jordan's Sci-Fi Family Drama 'Raising Dion'". Variety. Retrieved February 12, 2019. ^ Kit, Borys (May 13, 2016). "Michael B. Jordan Joins Marvel's 'Black Panther' (Exclusive)". The Hollywood Reporter. Archived from the original on May 13, 2016. Retrieved May 13, 2016. ^ Hipes, Patrick (April 19, 2017). "Michael B. Jordan & Michael Shannon To Topline 'Fahrenheit 451' Movie At HBO". Deadline. Retrieved July 20, 2017. ^ Campbell, Christopher (November 18, 2018). "Creed II First Reviews: A Solid, if Predictable, Sequel". Rotten Tomatoes. Retrieved November 16, 2018. ^ "Michael B. Jordan's 'Creed 2' KO's Box Office With Record-Breaking $55M Debut". Retrieved November 25, 2018. ^ Spangler, Todd (May 21, 2018). "'Black Panther' Star Michael B. Jordan to Lend Voice to Rooster Teeth's 'gen:Lock' Anime-Style Series". Variety. Retrieved May 22, 2018. ^ Kroll, Justin (July 24, 2015). "Broad Green Pictures Lands 'Just Mercy' With Michael B. Jordan (EXCLUSIVE)". Variety. Retrieved February 7, 2016. ^ "Warner Bros. Picks Up Michael B. Jordan Legal Drama 'Just Mercy'". Retrieved February 21, 2018. ^ Buckley, Cara (October 28, 2015). "Michael B. Jordan Gives Millennials Their 'Rocky' With 'Creed'". The New York Times. Retrieved January 13, 2016. ^ Kit, Borys (February 24, 2016). "Michael B. Jordan, MGM to Remake 'The Thomas Crown Affair' (Exclusive)". The Hollywood Reporter. Retrieved March 12, 2016. ^ Gilyadov, Alex (March 20, 2017). "THE MATRIX FOLLOW-UP RUMORED TO BE MORPHEUS PREQUEL". IGN. Retrieved March 21, 2017. ^ Mottram, James (January 3, 2016). "Michael B Jordan: Star of Rocky sequel Creed on why he goes for roles written for white characters". The Independent. Retrieved February 7, 2016. ^ Sangweni, Yolanda (May 10, 2014). "Michael B. Jordan Answers ESSENCE's Questions on Faith and Spirituality". Essence. Retrieved February 7, 2016. ^ "The Heartwarming Reason Why Michael B. Jordan Lives with His Parents". Flare. February 23, 2018. Retrieved October 17, 2018. ^ Berger, Sarah (February 20, 2018). "Why 31-year-old 'Black Panther' star Michael B. Jordan still lives with his parents". CNBC. Retrieved October 17, 2018. ^ "'Black Panther's' Michael B. Jordan To Star In Rooster Teeth Animated Series 'gen:LOCK'". Deadline Hollywood. Penske Media Corporation. May 21, 2018. Retrieved May 22, 2018. ^ "The Soap Opera Digest Awards: 2005". Soap Opera Digest. soapoperadigest.com. Archived from the original on February 25, 2008. Retrieved November 12, 2015. ^ "Friday Night Lights – Cast bios: Michael B. Jordan". nbc.com. Archived from the original on August 8, 2011. Retrieved August 5, 2011. ^ "37th Annual NAACP Image Award Winners, 2006". BlackFlix.com. Retrieved August 5, 2011. ^ "THE 38th NAACP IMAGE AWARDS TAKES PLACE WITH SUPERSTAR ENTERTAINER LL COOL J AS HOST" (PDF). naacpimageawards.net. National Association for the Advancement of Colored People. March 15, 2007. Archived from the original (PDF) on May 19, 2010. Retrieved May 17, 2010. ^ "Michael B. Jordan: The Ascension of A Star". BleuMagazine. July 13, 2011. Archived from the original on July 22, 2012. Retrieved August 5, 2011. ^ "EWwy Awards 2011: Best Supporting Actor Winner". Entertainment Weekly. October 11, 2011. Retrieved October 23, 2011. ^ Long, Tom (December 9, 2013). "Detroit Film Critics Society nominates top films". The Detroit News. Archived from the original on December 13, 2013. Retrieved December 10, 2013. ^ Feinberg, Scott (October 9, 2013). "Hollywood Film Awards to Honor Michael B. Jordan, Sophie Nelisse and David Oyelowo (Exclusive)". The Hollywood Reporter. Retrieved October 19, 2013. ^ Pond, Steve (October 24, 2013). "'12 Years a Slave' Leads Gotham Awards Nominations". The Wrap. Retrieved October 24, 2013. ^ "NATIONAL BOARD OF REVIEW ANNOUNCES 2013 AWARD WINNERS". The National Board of Review. December 4, 2013. Retrieved December 5, 2013. ^ Adams, Ryan (December 10, 2013). "Phoenix Film Critics Society nominations". AwardsDaily. Retrieved December 14, 2013. ^ Pond, Steve (December 8, 2013). "Oscar Isaac, Michael B. Jordan and Brie Larson Among Santa Barbara Fest's New Honorees". The Wrap. Retrieved December 14, 2013. ^ Venhaus, Lynn (December 9, 2013). "St. Louis Film Critics choose their award nominees". Belleville News-Democrat. Archived from the original on December 13, 2013. Retrieved December 9, 2013. ^ Tatko-Peterson, Ann (November 26, 2013). "Spirit Awards: '12 Years a Slave' leads nominations, 'Fruitvale Station' in mix". San Jose Mercury News. Retrieved November 29, 2013. ^ "The 14th Annual Black Reel Awards Nominations". Blackreelawards.wordpress.com. December 18, 2013. Retrieved December 22, 2013. ^ Rodriguez, Briana (January 9, 2014). "'Lee Daniels' The Butler' and 'Scandal' Lead NAACP's Image Award Noms". Backstage. Retrieved January 12, 2014. ^ "Austin Film Critics Association (AFCA) Nominations – Winners on Page 2". awardswatch.com. ^ Hall, Gerald (May 3, 2018). "Black Panther, Stranger Things lead MTV Movie & TV Awards nominations". EW. Retrieved May 3, 2018. ^ Ramos, Dino-Ray; N'Duka, Amanda (June 26, 2018). "BET Awards: 'Black Panther', Tiffany Haddish, Chadwick Boseman Take Top Honors – Full Winners List". Deadline Hollywood. Archived from the original on June 26, 2018. Retrieved June 26, 2018. ^ ""Roma," "The Favourite" and "A Star is Born" lead 2018 CFCA nominations". Chicago Film Critics Association. December 8, 2018. Retrieved December 8, 2018. ^ Jorgenson, Todd (December 17, 2018). "DFW Film Critics Name "A Star Is Born" Best Picture of 2018". Dallas–Fort Worth Film Critics Association. Retrieved December 17, 2018. ^ "2018 San Francisco Film Critics Circle Awards". San Francisco Film Critics Circle. December 8, 2018. Retrieved December 8, 2018. ^ ""Roma" Named Best Picture of 2018 By Seattle Film Critics Society". Seattle Film Critics Society. December 17, 2018. Retrieved December 17, 2018. ^ "2018 StLFCA Annual Award Winners". St. Louis Film Critics Association. December 9, 2018. Retrieved December 17, 2018. ^ "Toronto Film Critics Association Announces 2018 Awards". Toronto Film Critics Association. December 10, 2018. Retrieved December 10, 2018. ^ WAFCA Staff (December 3, 2018). "2018 WAFCA Awards Winners". Washington D.C. Area Film Critics Association. Retrieved December 3, 2018. ^ "2018 EDA Award Nominees". Alliance of Women Film Journalists. December 20, 2018. Retrieved December 20, 2018. ^ McNary, Dave (December 7, 2018). "Santa Barbara Festival to Honor Michael B. Jordan for 'Black Panther,' 'Creed II'". Variety. Retrieved December 7, 2018. ^ Whittaker, Richard (December 28, 2018). "Austin Film Critics Release 2018 Awards Nominee Lists". The Austin Chronicle. Retrieved December 28, 2018. ^ "Black Panther "Roars!"". Black Reel Awards. December 13, 2018. Retrieved December 13, 2018. ^ Tapley, Kristopher (December 10, 2018). "'The Favourite,' 'Black Panther,' 'First Man' Lead Critics' Choice Movie Nominations". Variety. Retrieved December 10, 2018. ^ Vonder Haar, Pete (December 17, 2018). "Houston Film Critics Society Announces 2018 Awards Nominations". Houston Press. Retrieved December 17, 2018. ^ Lodge, Guy (December 18, 2018). "'The Favourite' Leads London Critics' Circle Nominations". Variety. Retrieved December 18, 2018. ^ Petski, Denise (December 26, 2018). "'The Favourite' Leads Online Film Critics Society Nominations With 8; 'Roma' & 'Beale Street' Follow". Deadline Hollywood. Retrieved December 26, 2018. Wikimedia Commons has media related to Michael B. Jordan.